A church situated right on the High Street of Lincoln. Central’s mission is to be visible signs of the Kingdom of God by being available for ALL people. For this they utilise their people, their premises and their position. They express their faith using their strengths of friendship and hospitality, of Christian nurture and pastoral care and of the Arts and Music. *Occasional Evening services, please check plan for dates and times. **Messy Church usually takes place in the School Holidays. Please check the plan for the date of the next one. 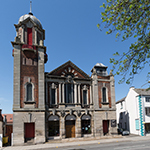 To find out more about Central Methodist Church, or to enquire about hiring the church building, please head over to our contact us page or email central@lincolnmethodist.co.uk to contact the minister.